All our workshops are non-profit and created or co-created by our members. Apart from the recurring workshops listed here there's also a whole range of other events taking place. Check the Calendar to find out what's happening week by week. Join Louise, Esmeralda and Michele every Monday for three hours of massage exchange in a very cosy environment. Bring a towel and some fruits to share. The hippie favorite BMS is a Wednesday umbrella event that changes its offerings from week to week, but frequent topics are different breathing techniques such as the Wim Hoff-method. It sometimes veers a bit too close to New Age or pseudoscience for many syntheists' science loving preferences, but we're generally a forgiving bunch of people. 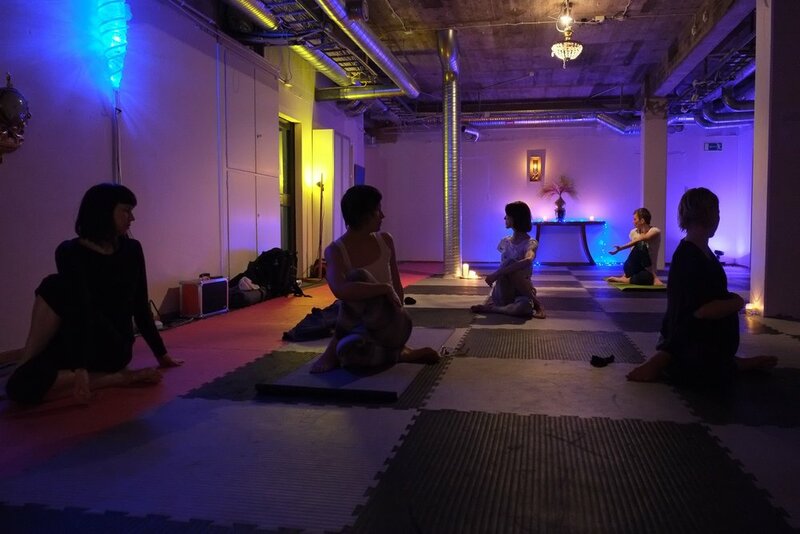 Free Flow is our largest weekly recurring event and takes place every Thursday evening. It's basically a small and sober rave where you are encouraged to express yourself freely through movement in a free and non-judgmental space. Every time features a new DJ and the music played can vary greatly from time to time. Nicke is our resident Zen practitioner who sits with whoever wishes to join him for a moment of silent introspection. This usually happens on Sundays. Every other Wednesday Sebastian and friends gather to paint whoever in the group volunteers to model for the others. No drawing experience required, all are welcome. Every Monday at 18.15 Gabriela and friends gather to take turns leading each other through a donations based yoga class. A shower is available on site. Tuesday evenings is the time to come to the Node if you wish to learn different African dances (mainly Mozambican ones) under the skilled guidance of Lisa and Celso (among others). Live drums! Do you have knowledge or a skill that you would like to share with the world? Stop procrastinating and let us know!